Create an additional revenue stream, increase customer traffic, improve customer satisfaction and increase customer loyalty by having an ATM machine at your location. Equipping your business with an ATM will not only draw in more traffic but will also generate an additional revenue stream and create a risk-free form of payment: CASH! Why go through the hassle of providing cashback facilities and racking up debit fees when you can earn a surcharge on every transaction performed instead? Generate potentially thousands of dollars a month in additional revenue, while receiving unparalleled customer service and technical support that is considered among the best in the industry. UBC's ATM Division can provide you with the perfect automated teller machine to suit your specific needs. We can even reprogram existing ATMs to provide you with lower rates and superior customer service. Placing a Mini-Bank ATM at your location will make your business more appealing to customers and it will earn you money. With this leasing option, you can set and earn 100% of the ATM surcharge fee meaning that all surcharge earnings will stay in your company's pocket. Ensuring that ATMs are properly stocked with cash can be a difficult task but you can eliminate this hassle with UBC's in-house vault cash solution. Our reporting and forecasting system notifies our central computers whenever your cash machine is running low, allowing us to replenish the machine regularly through our secure armored carrier service. 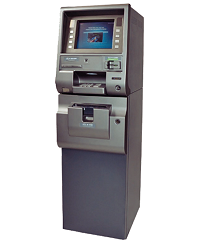 Contact UBC today and add the benefits of having an ATM machine at your location! *Surcharge must be set at $2.00. **Merchant receives $0.25 per transaction when enrolled in the Vault Cash Program. Sign up for our ATM processing service and UBC will provide you with a brand new ATM machine, free of charge! Your ATM will arrive preprogrammed from UBC Services in as little as 48 hours and will simply need to be plugged in to a power outlet and phone port to be ready for use. The terminal will automatically connect to UBC Services's network and you can begin accepting transactions immediately!